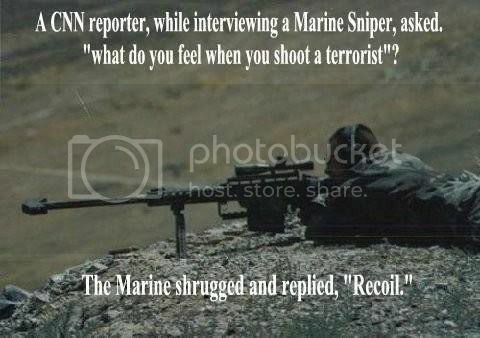 Reporter to sniper in Iraq. "What do you feel when you shoot an insurgent?" Sniper to reporter, "Just a little recoil." My personal favorite is the one I use when playing an online game, which also happens to be my signature. That and "I am a whisper, a shadow, I don't exist. By the time you realize I'm there it's already to late and by then I'm long gone. Why do some people belittle servicemen like this?? Daydreamers and BS Artists don't kill many enemy, and they certainly don't help our effort. They just make good men doing a fair job look like idiots. Too many war comics I think. Are you reading my mind, senojekips? Right after I saw that picture I checked snopes for it. Because reporters don't like to ruin a good story with the truth. Someone felt like making a cool pic I guess with perhaps a little agenda to go along with it.